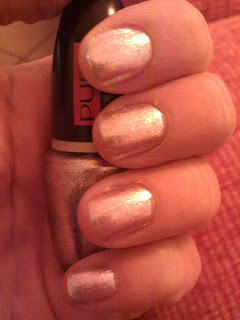 It was the best I could do: not a big fan of sparkle, I guess! This is Pupa Artbase in M031 (a ssparkly silver) and KIKO sparkle touch in 234 used as a topcoat. I love your shirt - that's my kind of sparkle! Hope that you are enjoying this challenge as much as I am.